Hi, I am interested in your 1968 Volkswagen Beetle (stock #5082-CHA) listed on Autotrader for $10,995. I'd like to get more information about this vehicle and confirm its availability. 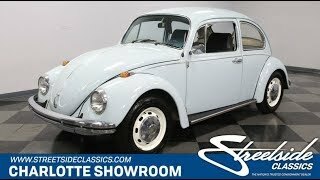 The classic bug is the true example of a vintage car thats affordable to obtain, easy to maintain, and ton of fun to enjoy. And this 1968 Volkswagen Beetle is the ideal example to fully uphold that tradition. The Beetle has an instant personality that comes from looking like nothing else that came before it. Sure, theyre crafted with precision German quality, but when its finished in a soft light blue like this one, you just want pet it like it was born instead of built. These VWs were famous for not changing much over its lifetime (thats how the operational costs remain so low.) But fans of the little car know that 68 comes from an ideal set. Its one of the years with the big back window that still carries a more classily-styled rear sheetmetal. Inside, this one continues the look of classic quality. This is also the era for high-back bucket seats with a button-top presentation up front, so its setup for all-day comfort. All the right pieces are in place, including the color-matched dash, vent windows, and grippy floor shifter. Plus, the classic steering wheel with Wolfsburg crest still gives an excellent view of the simple/elegant VDO gauge. This truly feels like rolling nostalgia. Volkswagens flat-four motor is the secret to the cars success. It has the hypnotic air-cooled hum that makes motoring fun. They built this 1500cc unit to be stout, and thats why it still fires up with ease today (plus, this one has plenty of maintenance records.) This isnt a muscle car, but smart engineering with the motor over the driving wheels makes this feel more substantial. And the control of a four-speed manual transmission means you and the machine feel like a team getting the most out of the motor. Its this full driving experience that adds to the personality and why the Beetle has such a loyal following. Complete with owners manual and maintenance records, this is the affordable and fun classic thats looking for a new garage to call its home. Call now!